The View Too is a newly renovated cabin in Grandview Resort. It is conveniently located just a few minutes away from all of the fun and action of Pigeon Forge. From the moment you arrive your cares will begin to melt away. The cabin is perfect for your family vacation, couples retreat or romantic getaway. It is comfortably furnished and your every need has been anticipated. The first floor features a Living Room with 57 Inch HDTV and Blu-Ray Player. There is a comfortable Queen Sleeper Sofa and Love Seat arranged for conversation. Adjoining the Living Room is a Breakfast Nook with Farm Table and the fully stocked Kitchen with Stainless Steel Appliances. Just off the Breakfast Nook is a 1/2 bath. The first floor Master Suite is elegantly furnished. It has a pillow top King Sized mattress and Private Bath. The Suite features a 39 Inch 4K HDTV and Blu-Ray Player. The First Floor Wrap Around Deck features a Gas Grill and Picnic Table; perfect for outdoor dining or board games. The heart of Second Floor is the amazing Game Room. It features a Air Hockey Table, Foosball Table and 60-in-One Arcade Machine with all your classic favorites like Pac-Man and Frogger and Donkey Kong. The room has a 65 inch 4K HD TV with sound bar and powered subwoofer for a theater like viewing experience while lounging on the Reclining Sectional Sofa. There is also a table for games or serving snacks. The Kids will absolutely love the unique, custom built Triple Bunk Bed. The game room is served by a 1/2 bath. The upstairs deck has an amazing view of Mt. LeConte and the Smokys and is a great place to begin or end your day. Unwind in the huge Hot Tub or enjoy the view from the Rocking Chairs or Log Porch Swing. The Second Floor Master Suite is luxuriously furnished and features 16 foot vaulted ceilings . It has a plush King Size pillow top mattress. Watch TV on the 39 Inch 4K HD TV and Blu-Ray player. The huge private bath has its own 2 person Jacuzzi and Steam Shower. Guests get 50% off on Wahoo Ziplines which is located in the resort. Just down the hill you will find the resorts' Olympic Pool with Kids Splash Zone and Hot Tub. In short, if your looking for a great retreat where you can unwind and capture the essence of the Smokys this it it. Reserve your dates now. This one will fill up fast. My wife and I are both Attorneys from Lake City, Fl. We have 3 College age Sons. We are very involved with our Church and its Youth Ministry. We have a 4 Bedroom cabin in same development, THE VIEW, 340601. We love it but we wanted a smaller cabin we could enjoy when the whole family was not traveling together. Our requirements were the same. A great view, close to town, no steep or winding roads. Easy in, easy out no matter the weather. Luckily THE VIEW TOO became available just a stones throw away from our other cabin. You can't beat the location. 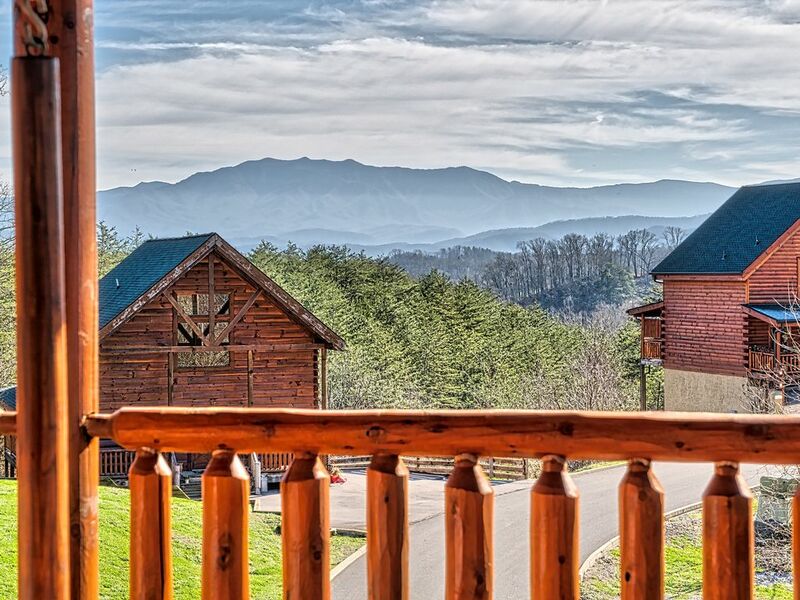 Grandview Resort is a smaller development just minutes away from Pigeon Forge. Great Views and not as touristy as most developments. First rate Community Pool and Guests get 50% discount at Wahoo Ziplines. The ability to take shortcuts means you will never have to fight traffic on the Parkway. Stainless Steel, Water and Ice in Door. Very nice cabin needing just a few items. Upstairs bathroom toilet does not flush correctly every time. Spider webs on window wall in upstairs bedroom. Were not able to use the main tv with the regular cable service, could only use it with Roku. Had difficulty regulating the heat so that the main living area was comfortable without having both the bedrooms too hot. We got here late at night. The house was everything we saw in pictures! This cabin was perfect! The lay out of the house and the furnishings made it so enjoyable. Everything you could want or need is there and it is such a beautiful setting. We had such a great time with our friends we cannot wait to do it again and we plan on staying in Lloyds home again. It was very clean and so close to everything. Lloyd was wonderful to deal with and responds to any questions within an hour. We arrived early in the day with our motorcycles on trailers and he was kind enough to let us drop the trailers there early so we could enjoy the day riding. The cleaning people were there and they were all very kind as we tried to stay out of their way. This was not how it went a few days earlier at a cabin we stayed at earlier in the week. This cabin and Lloyd are top notch and we cannot wait to stay there on our next trip. Thank you so much!!!! Wonderful family trip with the 5 kids to Dollywood!! It was very relaxing and a much needed getaway. The kids had a blast and the scenery war beautiful as well as the log cabin. Fit all 7 of us no problem with room for a few more! !